The Marque, established in 1962, serves as the yearly collection of the literary and artistic pieces created by Upper School students to summarize the academic year’s artistic expression. 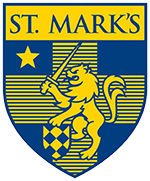 The Marque is an after-school extracurricular activity that works independently from the St. Mark’s journalism program. All written and visual content is welcomed an considered blindly and equally for publication. Throughout the year, literary works are submitted and selected for publication by our staff members. Artistic pieces are submitted both by students and faculty member within each respective discipline. This publication is submitted annually for evaluation to the Columbia Scholastic Press Association (CSPA).